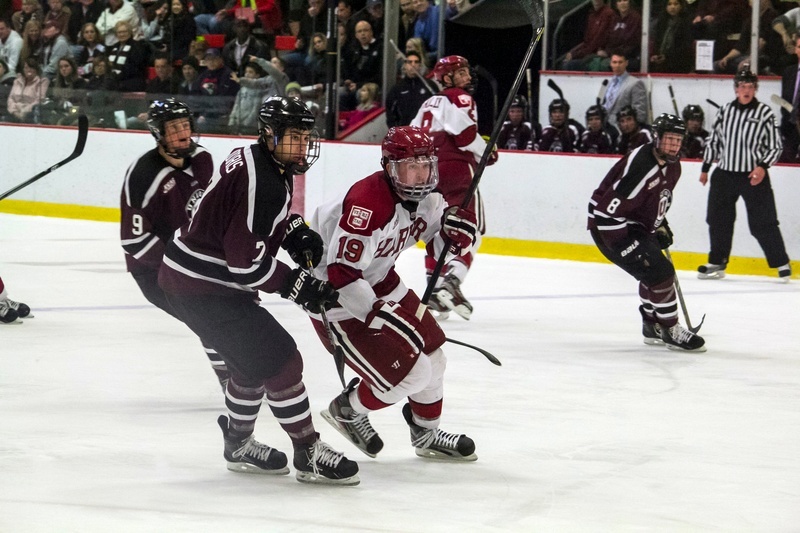 Sophomore forward Jimmy Vesey, pictured above in previous action, may be Harvard’s leading goal-scorer this season, but was scoreless as the Crimson fell, 6-0, to Northeastern on Monday evening. With both Harvard and Northeastern looking to end lengthy Beanpot championship droughts—21 and 26 years, respectively—the two squads faced off on Monday evening at TD Garden in the first round of the 62nd edition of the annual tournament. Leaving little suspense throughout, the No. 11 Huskies dominated the contest, as Northeastern (16-8-3, 8-5-1 Hockey East) blanked the Crimson, 6-0, to reach the Beanpot final for the third time in four years. Husky goaltender Clay Witt, who leads the nation in save percentage, collected his fourth shutout of the season. “All in all, it was just very disappointing,” Donato added. After falling behind, 2-0, early in the first period, Harvard (6-12-3, 3-9-3 ECAC) looked to turn the corner following a game misconduct penalty on Northeastern’s Josh Manson. But the Crimson could not take advantage of this five-minute man-advantage, failing to generate much offense throughout the entire penalty. The Huskies may have had to wait until after intermission to use the momentum from the extended penalty kill, but they wasted no time in the second period, scoring just 31 seconds into the frame on a Torin Snydeman goal. Northeastern added three more scores the rest of the way, including two power-play goals, the final one coming on a man-advantage opportunity from a major penalty called on Harvard freshman Kevin Guiltinan in the final minutes of the contest. The entire game was peppered with penalties, with the Huskies committing 15 and Harvard 16, while serving 41 and 35 minutes in the box, respectively. The Crimson also took itself out of power plays several times with penalties early in the man-advantage opportunity. Northeastern was able to jump out to an early lead after strong control of the puck for the first six minutes of the game. At 5:57, Husky Dalen Hedges skated around the right circle with the puck, firing it past senior goaltender Raphael Girard’s glove for his eighth goal of the season. After each team committed three penalties apiece in the first 10 minutes of the game, Harvard found itself down two skaters after consecutive penalties on junior defenseman Max Everson and Guiltinan. Northeastern immediately capitalized on this five-on-three advantage, with sophomore Kevin Roy receiving the puck in the center of the offensive zone, passing it to John Stevens, who then passed it right back to Roy for the one-touch goal. After Snydeman’s goal early in the second, Braden Pimm scored soon thereafter at 4:22, putting it past Girard on a four-on-three man-advantage for the Huskies to make it 4-0 in favor of Northeastern. Though the Crimson led the second period in shots, 13-10, the Huskies essentially put the game out of reach just 16 seconds into the third period, as Colton Saucerman fired a low hard shot from the center of the blue line. Mike Szmatula capped off the scoring for Northeastern with a power-play goal with 3:13 left in the game. Junior Patrick McNally and freshman Sean Malone led Harvard in shots on goal with four each but, like the rest of the team, could not find the back of the net. With the defeat, Harvard will face off next Monday against the loser of the BU-BC matchup in the first round nightcap. The game will mark the Crimson’s sixth straight consolation game since falling to BC in the 2008 final. The loss means that seniors like captain Dan Ford will end their Harvard careers without reaching a Beanpot final. —Staff writer David Mazza can be reached at davidmazza@college.harvard.edu.